This is a fine example of a hand-fabricated farmhouse vintage shabby chic wardrobe. Colourful, paint-distressed and full of original character. Imagine this impressive piece in your bedroom, kitchen or living room…it would surely add some great visual appeal to a retro or vintage styled interior. The double doors open to reveal an ample storage area. 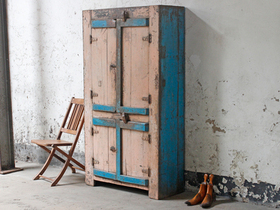 Shabby chic wardrobe: W99cm x D413cm x H180cm.